Our matelassé, with subtle texture, vintage striping, and feminine ruffles, is woven in Portugal of stone-washed cotton. 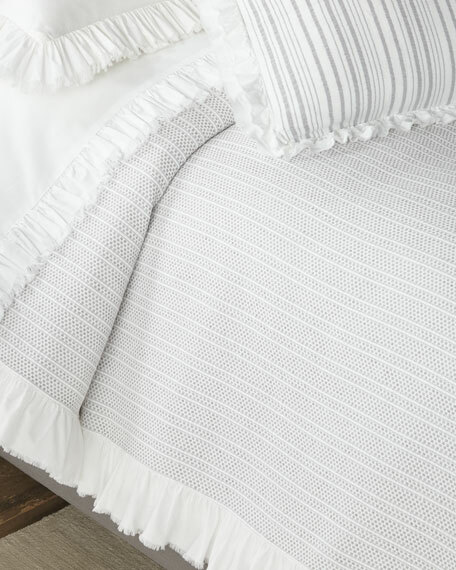 Cotton coverlet with ruffle edge. Pine Cone Hill, designed by Annie Selke, is a collection of bed linens with Selke's signature charming prints and patterns. The designer began making her Pine Cone Hill linens with a sewing machine on her dining room table. Today, the collection has fans across the country who love the line's easy sophistication.